I didn't really get into football until the '90s, so the first I ever heard of Jimmy the Greek is when his career came to an end after he gave that local TV interview about black athletes being better because of slavery. So to a viewer like me, who only knows Jimmy from the scandal (and from Phil Hartman's impression of him on "SNL"), "The Legend of Jimmy the Greek" did its job. It told me why Jimmy mattered before he ever opened his mouth to that DC camera crew, and why his life was colorful - and tragic - enough to merit the "30 for 30" treatment. 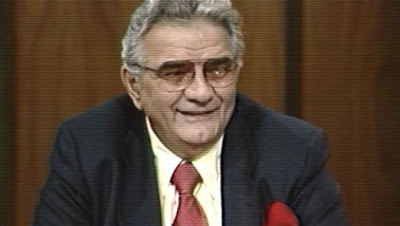 I didn't know that Jimmy set the line for Super Bowl III, that he was so influential in the public acceptance of gambling, or about all the tensions between Jimmy, Phyllis George and Brent Musberger in that classic "NFL Today" cast, or that CBS was more or less ready to dump Jimmy even before the scandal broke. Nor, of course, did I know any of Jimmy's personal life, including the murder of his mother and the deaths of three of his kids and how much all that tragedy weighed on him. (*) That, in and of itself, was a smart choice. The easy thing would be to start the film with Jimmy talking about the large thighs of the black athlete, but the point of the movie was that he was about so much more than that scandal. We still opened on a scandal, but it was one from when Jimmy's career was still ascendant, and a moment his colleagues looked back on as an amusing war story, rather than something to shake their heads at. And while Mitchell and the talking heads don't absolve Jimmy for what he said, I thought Brent did an admirable job of trying to at least place it into context - to suggest that there was some kernel of a point in there, but that Jimmy wasn't articulate enough (and too old-fashioned) to make it properly. I have to dock Mitchell some points, though, for the silly device of having "Jimmy" narrate the film. As Mitchell explained in the promotional clip before the film, he wanted Jimmy to be as much a character in the film as possible. That's a noble goal, but it didn't work. It's the sort of concept that you see sometimes in non-fiction prose (if I had one of my Best American Sportswriting volumes handy, I imagine I could find an article or twelve that tried it), but when there's an actor playing the part of the film's subject when everyone else is a real person - and when the subject appears frequently in archival footage - it's just awkward. Finally, a programming note. Billy Corben's "The U," a look at the Miami Hurricanes teams of the '80s, is the next film in the series, and it won't debut until Saturday, December 12 at 9 p.m., a break from the scheduling we've seen so far. After that, the next scheduled film is Dan Klores' "Winning Time: Reggie Miller vs. the New York Knicks," which isn't set to debut until March 14. I got to see a screening of "Winning Time" last week, and it was tremendous. Most of the "30 for 30" films so far have been tragedies (even the USFL one was ultimately about how disappointed everyone was that the league didn't work), and while "Winning Time" isn't exactly a victorious story (neither the Knicks nor Pacers won a title during the '90s), it's an often hilarious look at how much fun and energizing a great sports rivalry can be. So, a long wait, but some good stuff is coming. The Band one was pretty upbeat. Bet on Truman - pardoned by Ford. One of the original independents. It would have been interesting to know who asked him the question about black athletes and what the original question was. The post-mortem narration was a little hokey, but unique enough for me to just shrug off. I find it amazing how far sports betting has come since The Greek's heyday and, like you, I had no idea how instrumental he really was in pushing gambling to the forefront. His tale is tragic and the controversy is something I could imagine an old uncle or grandparent saying. To have one verbal mistake destroy Jimmy The Greek's life after surviving the death of two children is pretty shocking and saddening. It goes to show that the power of media and public backlash can be just as harsh as losing a loved one for a guy like Jimmy. agree with your point about the ghost narration. I also didn't know Jimmy's history (or how much he contributed to American gambling), but for some reason this doc seemed to drag on. And what year did this one cover? Usually they flash the montage of events for the year but I missed it. When are they doing the Iverson and Terry Fox docs? I've been looking forward to those since the beginning. Iverson was originally going to be in this first batch, but the director wanted to enter it in Sundance, and it can't have aired on TV before that. I imagine it'll be in that next group, maybe not long after the Reggie Miller one. They're trying to keep the docs at least somewhat tied to the part of the season when the sports they cover take place. Go read the comments from the Cleveland Browns fans on that one. They would tell a different story. Billy Corben? As in 'Cocaine Cowboys' Billy Corben? I thought this film hit all of the notes that the series is aiming at: a moving but largely untold story about someone of sports prominence in the last 30 years. Today, these scandals follow a media script: the apology tour; the appeal for sympathy; the exploration of the root causes; the comeback (possibly accompanied by a reality show). That wasn't so in 1988. When he was fired, Jimmy vaporized as a public figure (and, it seems, as person, too). You didn't hear about him again until his obituary. He was a great transitional figure, with one foot in gambling's criminal past and the other in the modern hype machine. I think most gambling experts would probably call Jimmy's experience at "setting lines" vastly overestimated. However, he brought so much attention, money, and even legitimacy to them, they went along with the charade. In this way he was kind of like Minnesota Fats-who was hardly a world-class billiards player. In his last few years, The Greek got pretty sloppy and lazy on "The NFL Today." I think, he would have been gone or given a vastly reduced role soon thereafter. But his influence was huge in the pre-ESPN/NFL Network world, where the only national showcases for football highlights/analysis were the half-hour "NFL Today" (at least for NFC cities) and Howard Cosell's MNF Halftime Highlights package. The ghost narrator was hokey, but Jimmy's gravelly, Steubenville-and-cigarettes voice was so essential to his persona, that I can see why the director felt the need to approximate it, rather than going the Liev Schrieber route. Is there any way to watch these online or on demand after they have aired? Due to work, I’ve only been able to catch the Gretzky/Colts ones and would like to catch up. I've been trying to figure out why this documentary didn't click with me, and I think it's because of the awe-shucks hokiness of the storytelling. This story seems like it should have been darker (the roots of sports gambling) instead of the light, sappiness that we saw with stuff like the Phyllis George interviews. Yeah, I had DVRed the first two 30 on 30's and unfortunately because of game overruns I did not get to catch the episodes. I keep hoping they would replay then but they haven't yet. The schedule at the official "30 for 30" site shows when several of these will be rerun over the next few weeks. Also, Bill Simmons just tweeted that, since ratings rose for the last two films, plans are in the works to do a repeat marathon at some point. This has been a great series thus far for two central reasons: the subjects of the films are striking a strong balance between awareness of the subjectd involved/overkill on coverage of that subject (the USFL segment split this atom particularly nicely), and we're getting enough material to tell terrific stories in one hour while also knowing there is a LOT more information to be read/viewed about all of them (like the horrors visited upon and strength shown by Len Bias' family since his death). I was surprised, then, to see that after the University of Miami segment, apparently they're going to take a lot of time off and not have anything new until March 2010. I get that ESPN's busy as can be with football and basketball and hockey, but it seems pretty abrupt to go from such well-received weekly films to such a lengthy hiatus. Anybody know why that's the current regular-scheduling plan? It's like you say, DolphinFan: ESPN is about to be incredibly busy. Once the new year begins, pro and college basketball takes up a whole lot of primetime real estate. It sounds like they're going to try to schedule them in "pods" like this one: a bunch of docs in a row, then a break, then a bunch more, etc. They have 30 films, and more than a year to show them in (the plan was for the series to cover about 15 months, I believe). how could anyone call The Band doc upbeat??? I thought this one was great. Young Musburger - all the stories about the NFL Today, and the back story on Jimmy. Just fascinating. This series has generally been outstanding. It's nice to see the overblown ESPN machine get one right.